We consider the significant components of our strategy to be the careful selection of round log, qualitative monitoring of the cut wood, and flexibility in marketing. The multilingual capabilities (D,F,NL,GB) of our employees and our location directly at the border of the largest European partner countries, as well as our central location near main traffic nodes are further unbeatable advantages. The customer is in direct contact with the decision makers, and therefore can expect sophisticated and custom tailored service. The following tables contain only standard dimensions. Special cuts can, of course, be run. The products can also be heat treated, dried, planed, impregnated, and lopped to custom lengths. 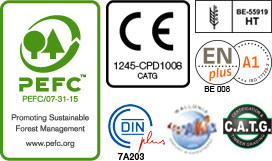 The ISPM 15 certificate confirms heat processing of the wood. The dimensional lumber is heated to 56°C core temperature over 30 minutes. This kills insects, and the product can be used in international transportation on the appropriate lines. These products are used mainly in the packaging and pallet industry. Construction lumber, are absolutely square edged, CE- graded and stemped, and is one of our mainstay products. Our customers appreciate our quick availability, flawless cut and wood quality, and our broad spectrum of stock products. Our cut lumber, dried and planed to a wide variety of dimensions, is also used extensively in wood frame construction. We can of course adopt our cut measure to your request.